Spicy Yellow Fish Curry Recipe | Simple. Tasty. Good. It was again time to dip up what edible stuff there was still left in my freezer and fridge. And a good opportunity to clean them out, give them hard-working machines a well-deserved rest and save some electricity. 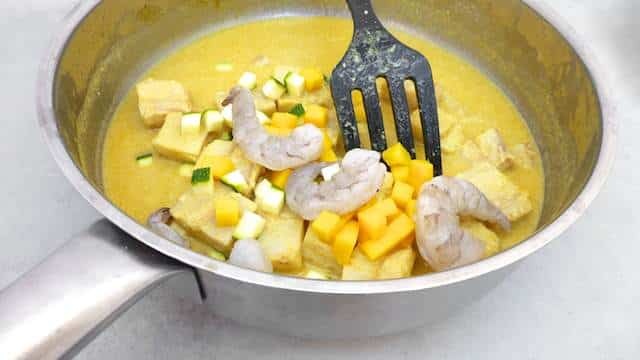 So let’s see: half a package of Thai yellow curry paste, frozen prawns, frozen pollock, half a zucchini, half a mango (what was left after making a spicy mango salsa) and a can of coconut milk. Sounds like we’ll have a Thai flavored fish recipe here! 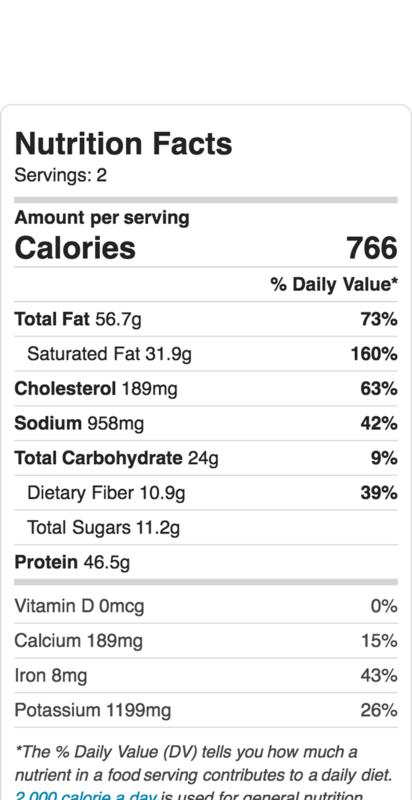 I added some grated coconut for texture, optional but recommendable! 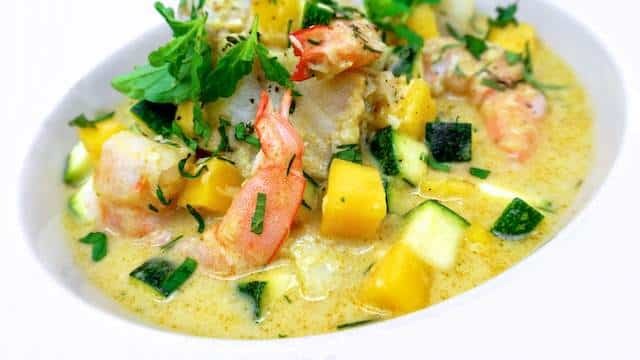 The subtle prawns, fish and zucchini are a prefect match for the sweeter mango and coconut milk. Don’t make this fish curry too spicy! Pour a little sunflower oil in a large non-stick pan and place it over medium heat. 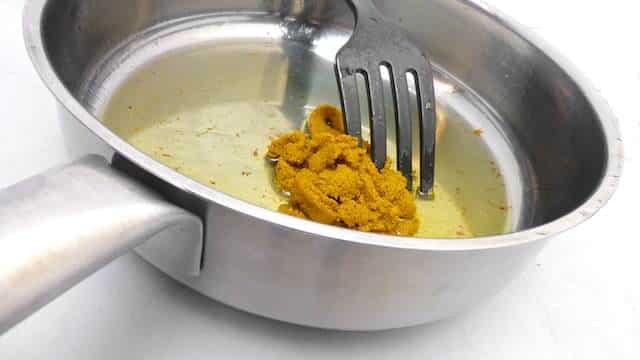 Add the yellow curry paste once the oil is hot. Stir fry the curry paste for a minute until fragrant. 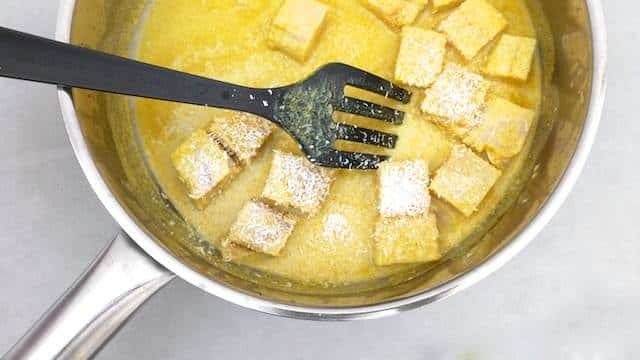 Then pour in the coconut milk. Stir well again. 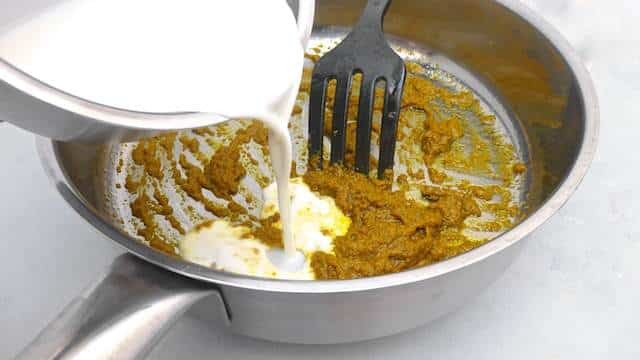 Let the curry sauce boil for 2 minutes over medium-high heat until the curry paste lumps have totally melted into the coconut milk. 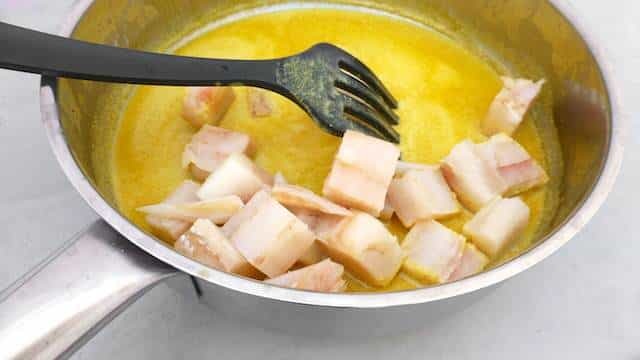 Dice the fish into bite-size pieces and add them to the sauce in the pan. Cook the fish for 3 minutes. Add the grated coconut, half of the lime juice and half of the fish sauce to the curry. Stir well. Add the peeled prawns, the diced mango and the zucchini. Stir the curry well. Put a lid on the pan and let the curry cook for another 5 to 6 minutes. Check the seasoning and add extra fish sauce or lemon juice to taste if necessary. Scoop the fish curry into bowls. Sprinkle with freshly chopped mint or coriander. Serve hot.